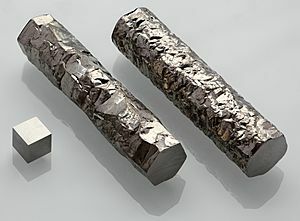 Zirconium is a chemical elemental metal. It is a greyish-white in color. It is atomic number 40 on the periodic table. Its symbol is Zr. And it is in the family of four (4). Zirconocene dichloride, a representative organozirconium compound. Zirconium Facts for Kids. Kiddle Encyclopedia.